Title: Le graphiste, l’artiste et le livre. Le rôle du design graphique dans l’édition d’art contemporain. (The Graphic Designer, the Artist and the Book. The Role of Graphic Design in Contemporary Art Publishing). Organised on the occasion of the exhibitions “Kiosk (XXI)” and “Doubles Pages,” a seminar was dedicated to graphic design within contemporary art publishing (books, catalogs, journals, magazines) and to the relationships between graphic designers, artists, editors and publishers. Lecturers: José Albergaria and Rik Bas Backer [Change is Good], (graphic designers, Paris), Jean-Marie Courant [Regular] (graphic designer, Paris), Alexandre Dimos and Gaël Étienne [DeValence], (graphic designers, Paris), Christoph Keller (publisher, curator of the exhibitions “Kiosk” and “Doubles Pages”), Jeff Rian (art critic, writer and editor of Purple, Paris), Kristina Solomoukha (artist). 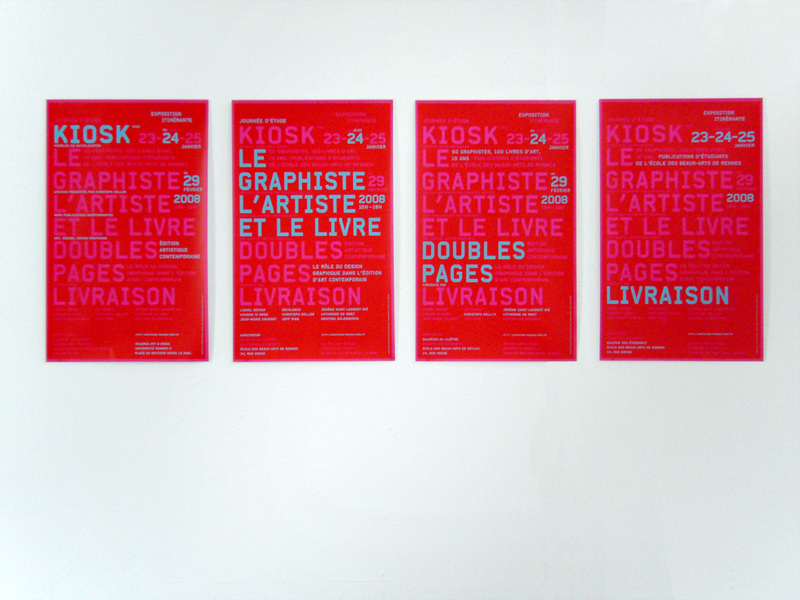 Photo: Posters designed by students Nicolas Chaverou, Caroline Fabès, Joséphine Guérin, Vivien Le Jeune Durhin.